After window shopping through the downtown streets of Portland, Maine we did some searching along the waterfront for an outdoor, yet shaded escape from the 95 degree sun. 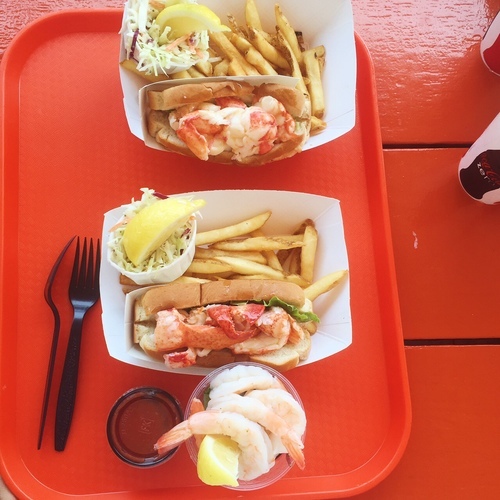 After asking a few locals and doing a bit of research, we stumbled into Portland Lobster Co. At first glance it looked touristy, but with a perfect view, full seats and the perfect summertime vibe, we knew we hit a decent spot. Order at the window, then find a seat along the deck lined with brightly colored picnic tables or snag a seat at the outdoor bar. Upon ordering, you'll receive a lobster buzzer (how cute!) to let you know when your order is ready at the outdoor pick-up window. They had some awesome live music playing that afternoon, which added to the perfect coastal vibe. So far, judging from their design through to the decor and service - I thought everything was just about top notch. The atmosphere was casual, but not too casual - it really was a nice balance. We ordered a few bottled beers to start from their decent & hand crafted selection. But onto the most important part, the food. We got a few different things to taste, but we all went with lobster rolls for the meal. Starting with the shrimp cocktail, I thought these were pretty decent. It came with 5 shrimp, atop a bed of greens and a lemon wedge. I have had larger shrimp before but these were a good size. Tender and fresh with the homemade cocktail sauce being the kicker. It wasn't too spicy and really complimented the shrimp nicely. We also ordered the fried calamari, which unfortunately we were all disappointed by. It consisted of all rings and no tentacles. It didn't have any calamari flavor whatsoever. It sort of tasted like we were just eating fried batter. The house-made "red tartar sauce" that it came with was interesting to say the least, but it definitely would pair well with more than just batter. The prices on these appetizers were fairly reasonable. Onto the lobster rolls, they were market price at $16.99. With a side of fries and some slaw, I thought it was definitely a fair cost. The fries and slaw were nothing special, although they hit the spot. The slaw could have used a bit more punch though. The rolls themselves were meaty and well cooked on a standard, lightly toasted bun. I like how they kept it simple here : a pound of meat with a good mix of tail, knuckle and claw atop a lettuce leaf. There were no condiments, except for a brush of butter on top of the chilled lobster meat. These were definitely some decent lobster rolls, although the flavor was lacking just a bit. The lobster meat didn't seem super sweet but it was definitely fresh. Maybe if the lobster was warm it would have been a bit better, but for what it is it was a solid roll. 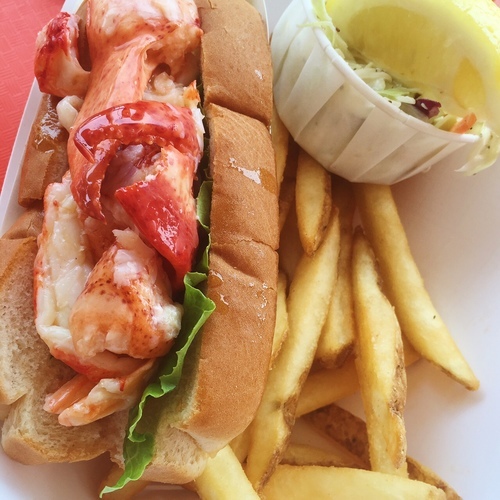 Portland Lobster Co. recently won a few awards: Best Lobster Roll, Best Seafood and Best Patio. I would definitely give them best patio for sure - the atmosphere here is great. Best Lobster Roll - well... its definitely good. But I'm sure there are better, especially if you consider the entire state of Maine. I will say though, that I like this one better than The Clam Shack in Kennebunkport for these reasons: it is on a traditional roll, not a burger bun, it comes with sides and the atmosphere & prices here were much better. Both claimed to be about the same portion, although this one seemed a bit meatier. That being said, The Clam Shack's meat was a little more flavorful. 180 Commercial St., Portland, ME.